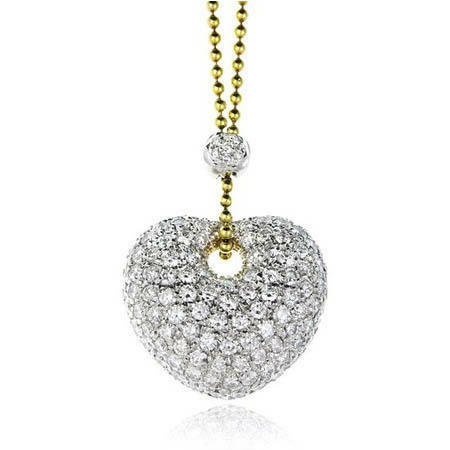 This lovely Leo Pizzo 18k white and yellow gold heart pendant necklace, features round brilliant cut white diamonds, pave set, of F color, VS2 clarity and of excellent cut and brilliance weighing 4.12 carats total. The chain is beautifully handcrafted and is 17 inches in length. Diamond Details: Round brilliant cut white diamonds, pave set, of D-E color, VVS clarity, of excellent cut and brilliance, weighing 4.12 carats total. Pendant Design: Leo Pizzo 18k white and yellow gold heart design. 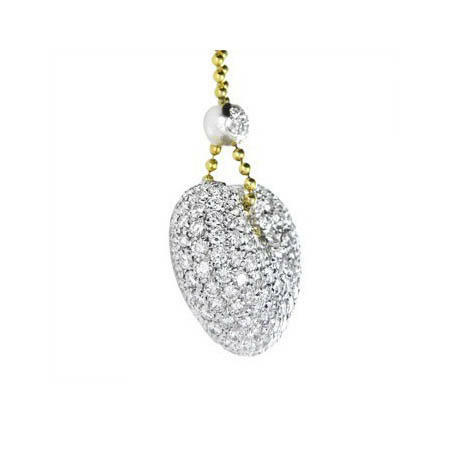 This lovely Leo Pizzo 18k white and yellow gold heart pendant necklace, features round brilliant cut white diamonds, pave set, of D-E color, VVS clarity and of excellent cut and brilliance weighing 4.12 carats total.